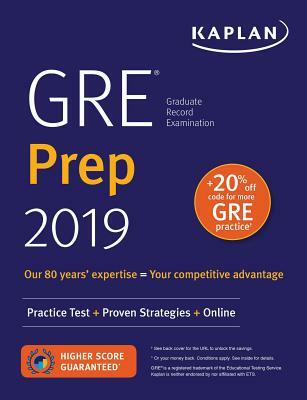 Kaplan's GRE Prep 2019 guides you through your GRE prep step by step—study Kaplan's proven strategies, boost your math skills, practice your pacing, and become an expert in the exam's computerized format with an online practice test. Kaplan is so certain that GRE Prep 2019 offers all the knowledge you need to excel at the GRE, that we guarantee it: After studying with the online resources and book, you'll score higher on the GRE—or you'll get your money back. One full-length online practice test helps you practice in the same computer-based format you'll see on Test Day. One additional brand-new full-length practice test included in the book for easier reference and review. More than 650 questions with detailed explanations, including new questions for this edition. Personalize your study plan with the individual performance summary you'll receive after each test. Chapters on each GRE question type and math skill, with practice sets for each. Questions have been reviewed, revised and updated for 2018-2019 by Kaplan's all-star expert faculty. Want additional video lessons, more practice tests, mobile study options, and extra online practice? Try GRE Prep Plus 2019. With a full array of self-paced and live online courses, as well as print books and mobile apps, you can use Kaplan to study on your own schedule and at your own speed. Kaplan's private tutors and admissions consultants supplement those offerings with one-on-one support.